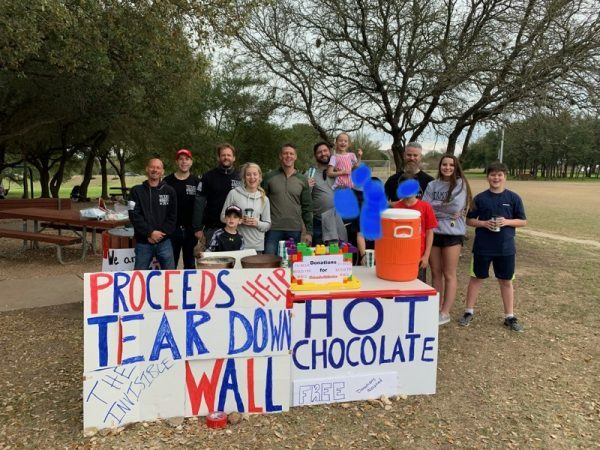 A 7-year-old boy from Austin incurred the vicious backlash from neighbors who opposed his hot cocoa stand to raise money for the border wall, but now he’s taking the country by storm. 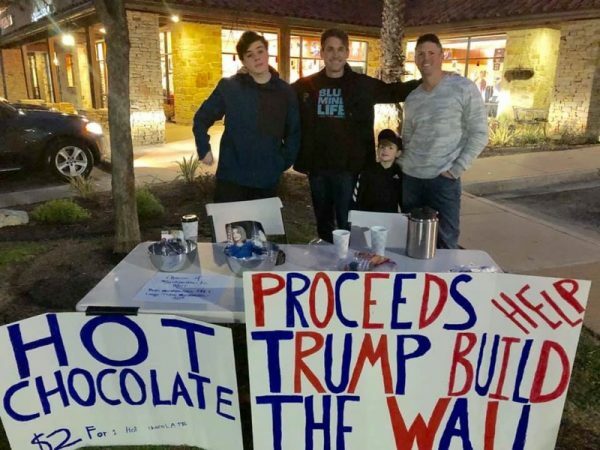 Locals went so far as to denounce him as “Little Hitler” – to his face – after Benton Stevens was inspired to set up the stand as a fundraiser for the southern border wall construction project after watching the President’s State of the Union address. There has since been a media firestorm that has turned him into a national sensation. With media appearances, social media support from people such as Donald Trump Jr. and Rep. Dan Crenshaw, and a personal invitation to meet with President Donald Trump next month, Benton’s border wall mission has taken off, despite the haters. After watching the State of the Union address in February, Benton was concerned for the country’s safety, and it inspired him to take action. “Benton got really into it and didn’t want to stop watching it,” his father Shane Stevens told American Military News. That night, Benton begged his parents for help setting up a fundraiser. Benton said, “I want to do a lemonade stand to help President Trump raise money for the wall,” Shane recalled. Shane and his wife Jennifer supported Benton’s idea and enthusiasm, but their son kept pressing them until Shane agreed to help with the stand; he changed the beverage to hot cocoa. Within 30 minutes of setting up his stand, Benton received his first customers. 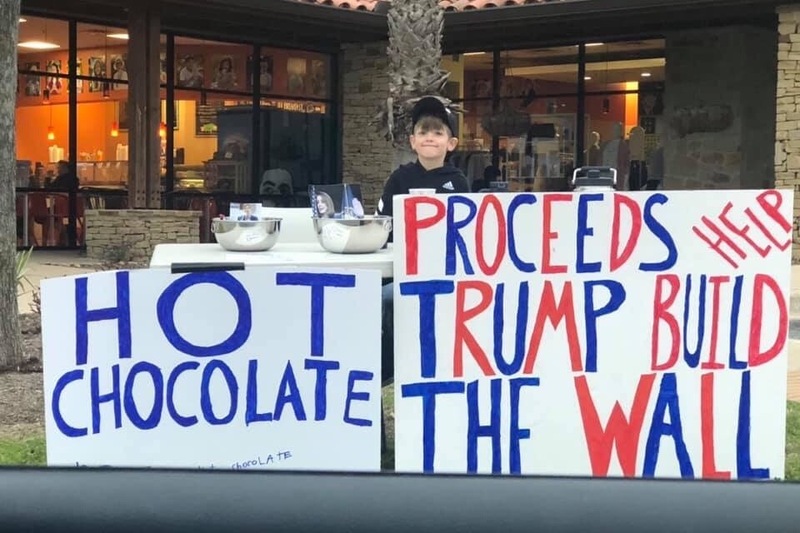 His homemade sign in red and blue marker advertised his mission; a bold but mighty effort to “help Trump build the wall” at $2 per cup of cocoa. That hand-drawn sign, however, translated to Nazism in the eyes of border wall critics. “It turned into this crazy ordeal in our neighborhood,” Shane said, adding that people even booed Benton for his stand, and one critic told him “Nice work raising a little Hitler,” while others accused him of teaching racism to his son. Despite those harsh comments, most of the reception has been supportive. Benton raised nearly $1,400 from three hot cocoa stands, and the media coverage amassed millions of views that rendered interest for more donations. Benton has remained positive despite the criticism. Of the critics, Benton said, “I guess I have to thank them, because without them being mean, I wouldn’t have gotten this much attention and been able to raise this much money,” Shane recalled. Benton raised another $13,000 on Venmo in support of his border wall funding efforts. When Venmo shut it down, he moved to GoFundMe. After cash, check and PayPal donations, he has raised around $20,000 in a month. “Love American entrepreneurship. Well done buddy!” Donald Trump Jr. tweeted last month in support of Benton. Love American entrepreneurship. Well done buddy! 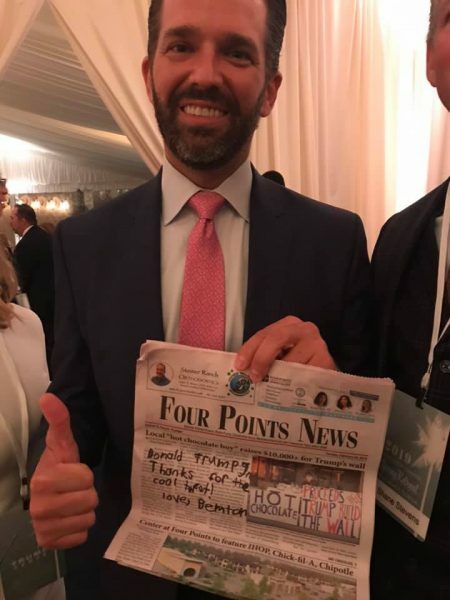 Benton wrote Trump Jr. a message of thanks on the cover of a newspaper he was featured in. It was presented to him by Shane and Jennifer. “Go Benton! Don’t worry about the haters. It’s a shame that some adults are so full of hate that they can’t be decent to a 7 year old boy who supports Trump,” Rep. Crenshaw posted on Facebook in support. The reception has been so positive that Benton was invited to meet with President Trump next month, and separately, he and his family were also invited to the White House to celebrate Easter. Now he’s partnered with veteran Brian Kolfage’s group, “We Build The Wall,” which raised more than $20 million on GoFundMe to directly fund the border wall. Kolfage’s group will help Benton’s funds apply directly to border wall construction efforts. He doesn’t just raise funds, either. Benton set up a free hot cocoa stand in support of first responders. For another stand, he invited people to sit down and chat about their differences, hoping he could have a decent conversations with his critics, but they didn’t show up for that effort. Shane said Benton’s effort has been well received with the military too. He’s worked with a wounded vets group, and two high-level military generals requested to meet with Benton to voice their support. Their support has motivated Benton even more, knowing that service members make great sacrifices, while only a little effort on his part can support a bold mission, Shane added. This story has been updated to reflect that Benton Stevens was separately invited to meet President Trump, and attend the White House.